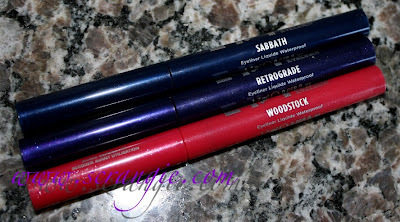 Urban Decay's 24/7 Glide On Eye Pencils have been a favorite product of mine for as long as they've existed and now they have a waterproof liquid counterpart perfect for creating waterproof winged liner looks. 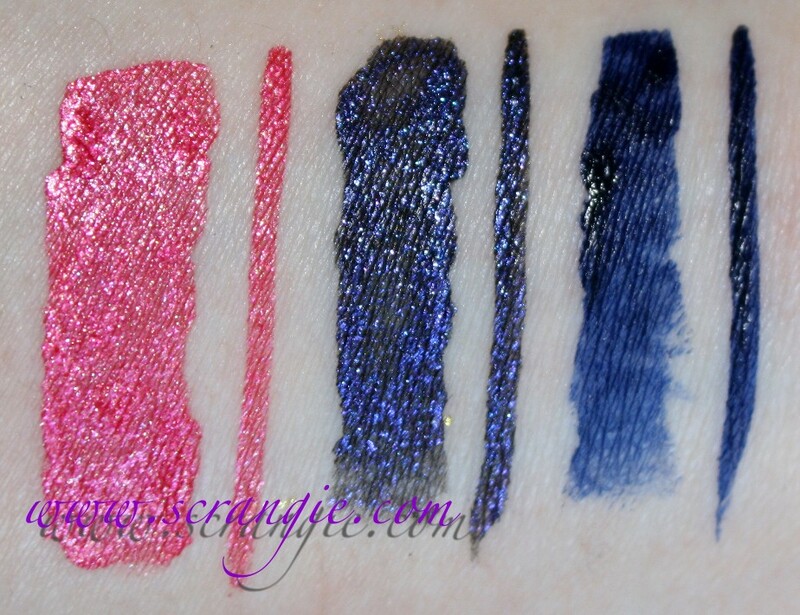 The Urban Decay 24/7 Waterproof Liquid Liners are waterproof (obviously), colorful and will be replacing the old-style, non-waterproof Urban Decay Liquid Liners (*tear*). The new waterproof 24/7 liquid liners come with a very, very skinny brush. No sponge or felt tip applicator on these. 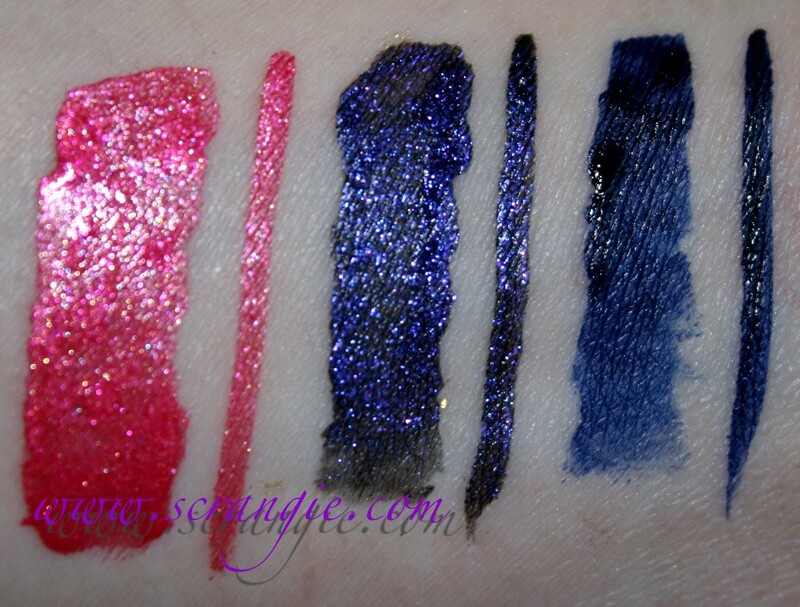 Took a bunch of pictures to try to show the sparkle in the two shimmer shades. 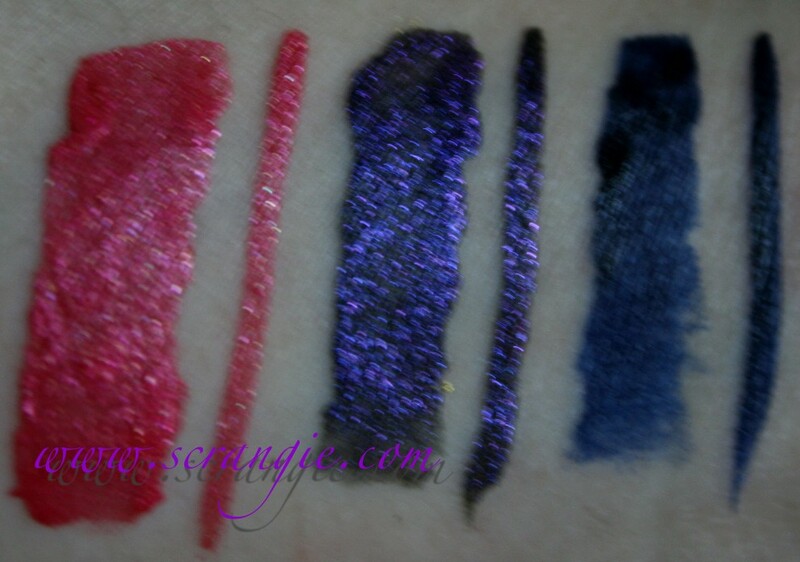 You may need to enlarge the pictures to see it, but Retrograde has some really pretty shimmer to it. Woodstock is the color I've been waiting for in an eyeliner. It's a candy pink that's not too light and has some shimmer to it to keep it from looking chalky. It's not necessarily bright but it is vibrant. 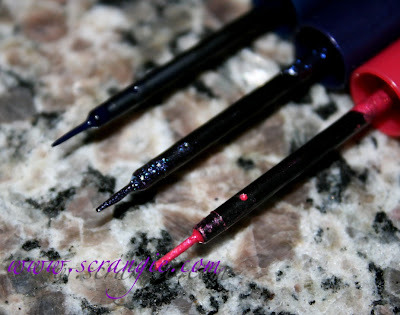 Seriously, how long have I been looking for a good pink liner? Retrograde is not the color I thought it would be. It's a blue-black base with some shiny, dark blue-purple iridescent shimmer particles in it. It's not noticeably purple on the eyes, like, say Ecstasy or Delinquent, but it does have a purple shine to it. Very dark. 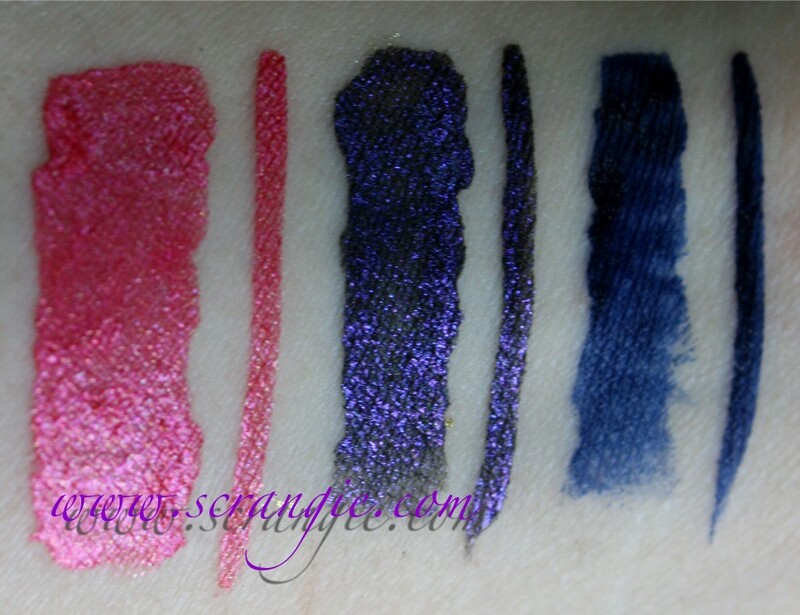 Sabbath is a matte navy blue liner. Darker than Stila's Cobalt liquid liner but not so dark that it looks black. See how it looks mostly blue-black with some shiny dark purple sparkles? Goes really well with green shadow. Attractive packaging that matches the color inside which makes it easier to find the color you're looking for. Not big and clunky like the old eyeliner packaging. Very aesthetically pleasing. Thin brush gives a precision application, thin lines possible. Waterproof formula only comes off when you want it to. Good color selection, especially nice to see a hot pink liner. Good value, reasonably priced; $18 for 0.25 fluid ounces. None of the colors stained my eyelids. The formula is very runny. I wasn't expecting it and ended up with an eye full of liquid liner the first time I used it! You must shake these very well before use. Woodstock and Retrograde weren't opaque on the first stroke, I needed two to three layers for complete coverage. The brush is a little bit short, I had an easier time applying with the longer old-style brushes. I wish Retrograde was more purple! They need an Ecstasy equivalent in the new formula. Overall, I liked these- especially Woodstock. Can't tell you how happy I am to see a good pink liner here. I'm also pleased with the price point- $18 for 0.25floz of product, making this one of the most cost effective waterproof liquid liners out right now. Though, I must say, I am sad that they are completely discontinuing the old liquid liners and not bringing back the old colors. No more Gash (SO SAD ABOUT THIS!!! ), no more Ecstasy, no more Lucky or Acid Rain. I really, really hope they bring out more shades in the new formula because I don't know what I'll do when I finally use the last of my old liners. The new formula is nice and smooth, waterproof and has immensely improved packaging, but still... No more Gash! These are available now at Sephora and everywhere else that sells Urban Decay. Oh Woodstock, how I need you in an eyeliner, eyeshadow, lipstick, blush, EVERYTHING! I love that hot, hot pink shade. Just wanted everyone to know that the old style liquid liners are 50% off on the UD website. Like the look of these. Thanks for the warning about shaking them.